I am trying to function as normal even with a YUCKY cold! Blah! I wanted to show you a few things I have been working on. 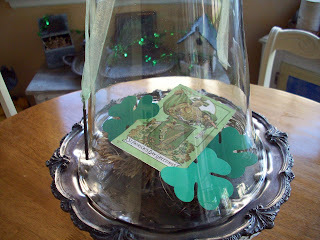 The St. Patty's Party hat! 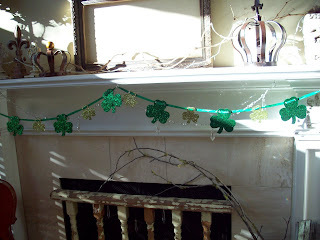 I have been decorating my house with the few St. Patrick's Day decorations. 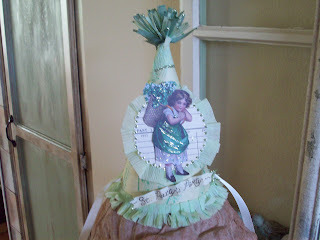 I made this party hat last year. I try to do a little decorating for each holiday. 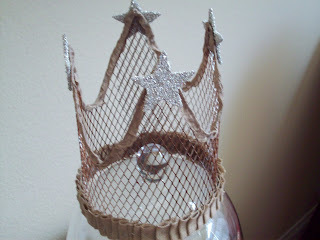 The crown with the stars all around it, is a new one that I have wanted to try for sometime now. It's made of rain gutter screen. I had seen something like it awhile ago on Carol's blog. I immediately wanted to try one for myself, but I had a hard time finding the right screen. I finally found some. 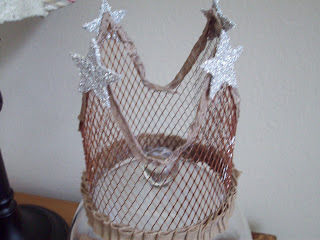 I really like working with it, it's quite flexible, and easier than the chicken wire. It seems I have been into neutrals lately, so I used linen and seam binding, after painting the screen with a rusty color. 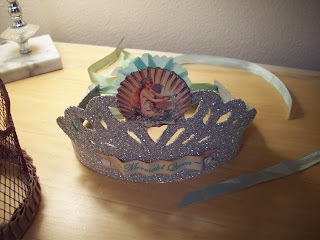 The other two crowns, have a mermaid theme. I was asked if I could do something with mermaids. So far this is what I have come up with. 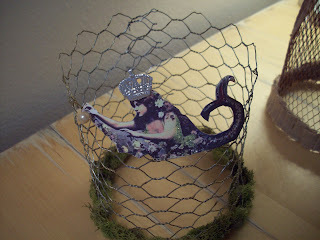 Of course I had to find some vintage looking mermaids. No modern mermaids here! 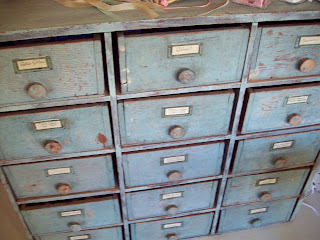 Well I'm off to take some cold meds, and get back to glittering. 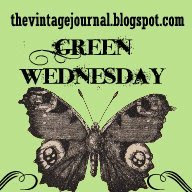 Denise at, http://thevintagejournal.blogspot.com/ is hosting Green Wed today. 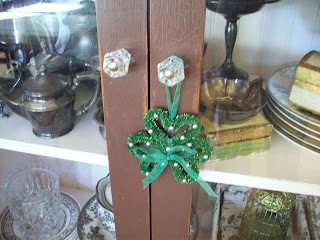 So I am posting my green St. Patrick's Day decorations and a few other items. You could post actual green items or recycled items. Green reminds me of Spring. It will be here before we know it. I already have some flowers starting to bud, and new fresh leaves sprouting on my trees. 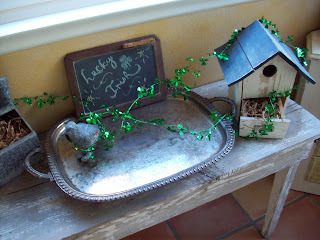 So if you get a chance go over to Denise's blog today, and check out all of the green. Just got back from my morning walk, as it started to rain. 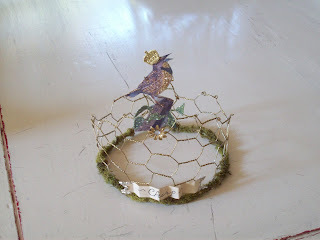 I am in for the day now working on these wire crowns. 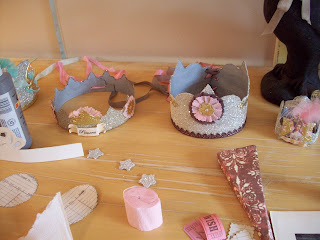 I am inspired to make some of these crowns for Spring, now that I feel it's on it's way. I have flowers coming up, and tiny new leaves on my birch tree! Yay! for that. 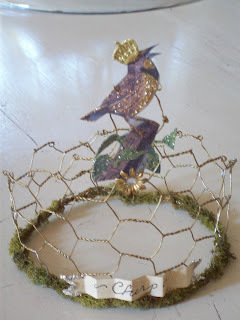 The cute little bird on the crown is from the Graphics Fairy! Karen is the best! 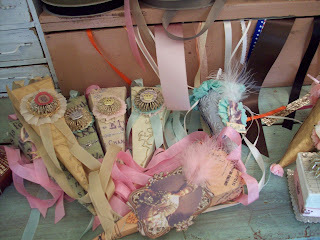 She has fabulous graphics for your use everyday! Check out her blog. Chat again soon! Happy Birthday to my friend Jamie!!! My nephew Joey was making his Confirmation on Saturday, which was also Valentine's Day. Joey is the oldest son of my brother Tony. Tony and his wife Debi have 3 boys. All smart, cute, talented, and funny. We laughed the entire time. It was a great time for our family. My mom, and aunt also traveled up as did my daughter Amanda, and her husband Joe. The Confirmation was lovely, followed by a family party. On Sunday,after we had a birthday brunch for my aunt, my husband and I took off for a drive to Port Costa California, home of the beautiful, and famous artist Wendy Addison. 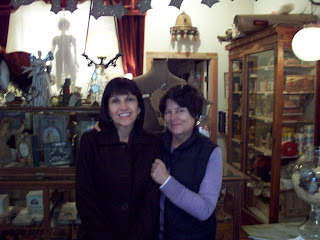 I emailed Wendy a month ahead to find out if she would be there to open her amazing shop. Well, much to my happiness she was going to be there. From my brother's house it was a 40 minute drive. Up a winding two lane road to what looked like the middle of nowhere. As we finally approached the end of the road before the town of Port Costa, my eyes widened. The town looks like a place time forgot. It was like stepping back into Victorian times. It felt a little like a movie set,only real. 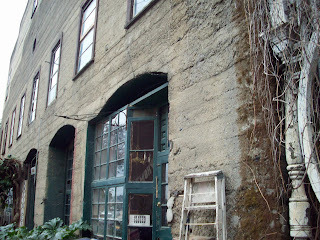 Port Costa was a grain shipping area back in the late 1800's. 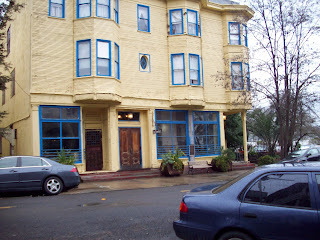 As you can see from the photos, the big yellow building was and is still a hotel. 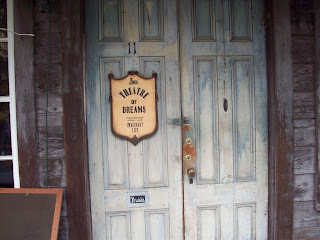 The big faded green doors to Wendy's shop, the Theatre of Dreams. 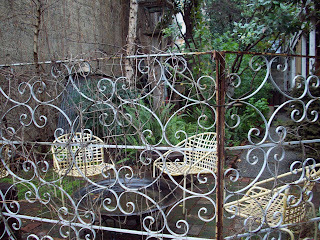 The garden area between her shop, and her workspace where she keeps her letterpress. 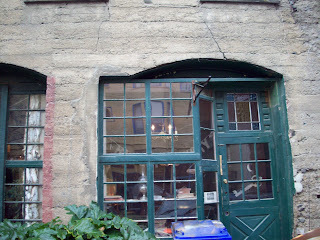 It is where she is working on her wonderful new book, that I was lucky enough to purchase. It is a one of a kind first edition, all done by hand. Written, and illustrated by Wendy herself. My husband purchased one for me as my Valentine gift. As we peeked in the window of the shop, there she was looking out at us. I said to my husband, I think that is her. I didn't recognize her new shorter haircut. She was so sweet, and adorable. She welcomed us in, took the time to show us around, and let me spend as much time looking as I wanted. Of course I had to do a little bit of shopping. She showed us the fairy theatre she made out of antique pieces, as well as the larger fairy theatre you see in the photo. I am telling you, it was so magical, it made you feel as though you just stepped into a fairytale. Even my husband was fascinated. The history of the town and the ambiance was just a wonderful experience. I met 2 of Wendy's 4 cats. Very sweet! She took the time to take me next door to her workshop. 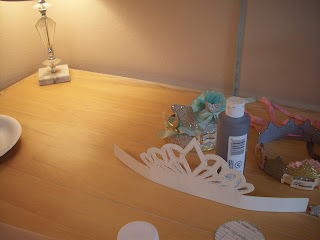 It is where she creates her fabulous art. I couldn't believe I was standing in Wendy's workspace. See the stunned look on my face. If you ever get the chance to go to Northern California, try to visit the Theatre of Dreams, you will love it. Wendy's shop is open by appointment or by chance. PS, I didn't take as many photos as I would have liked. I think I was having too much fun, and kind of forgot. I also forgot to mention it was cold, and rainy the whole weekend, but who cares? 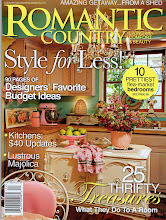 I will be taking a little Valentine weekend away with my sweetie. 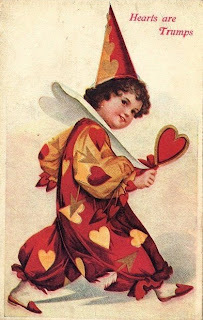 I wanted to wish you all a very Happy Valentine's Day!! 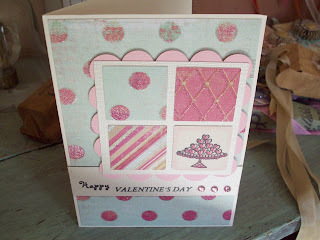 The pretty card you see is from my very good friend Jean in Rhode Island. Jean doesn't have a blog, but we met through my blog. Now we chat every morning. I can't wait to go to Rhode Island sometime and meet her in person. I love my card Jean, thank you so much!! Jean's BFF is having a birthday this weekend. She is nicknamed the Queen, so Happy Birthday to your Majesty!! We are having a lot of rain these days here in Sunny California. It's great, we need it. 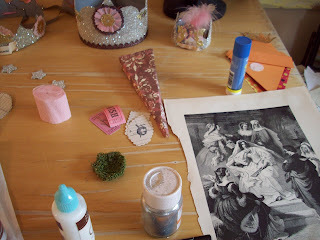 There was a brief moment of sun, so I started snapping away at the mess I have in my work area. 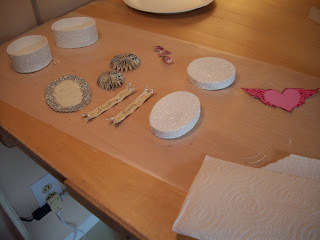 It's a day of making and creating!! I always clean up at the end of the day. I am one of these people that has to have everything cleaned up or I can't move on to the next thing. I can't sleep if there are dishes in the sink etc. 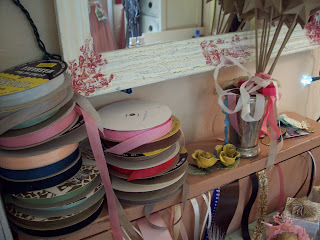 Just thought you might like to see my messy creating space on this rainy Monday. Hope you are having some messy fun as well! A Raven With A Name! It was very difficult choosing the winner of name the mascot. You all came up with some great names. I decided to combine 2 of them, so that means we have 2 winners. 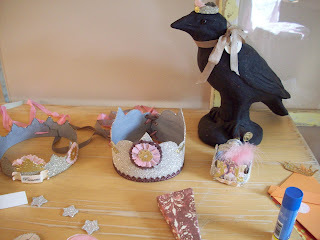 Nancy came up with Princess Crowy, and Lisa B. came up with Poe. 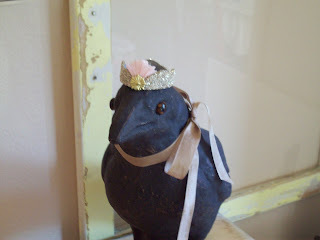 I like Princess Crowy Poe. Lisa does not have a blog, so Lisa, please email me with your address, as well as you Nancy. Please email me your address so I can send your prizes out to you ASAP. We are having a rainy weekend here in Southern California. We are finally getting our much needed rain.